Everyone has a story. Stories with ups and downs. When a storm blew Mr. Morris Lessmore away and his words right out of his book, he was left wandering. 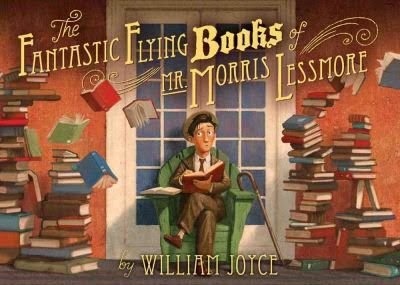 A flying squadron of books happened by, though, and he was led to a wonderful nest of stories. He spent his days there until his own story was finished. I may or may not be embarrassed to admit that this book brings a tear to my eye; it is so beautiful. I love it so much and I think it captures the magic of books perfectly. If you are a book lover and have not yet picked up this story, go now. Go and find it. Bring some tissues. In the mean time, there happens to be an Academy Award winning short. So you can watch that. With some tissues. (It starts at 0:15). Or you can download the app. Because there's that, too. I mean, it's just that good, okay?